Detroit Archbishop Emeritus Edmund Cardinal Szoka has died at the age of 86. He served as Archbishop of Detroit from 1981 until 1990 and went on to oversee the government of the Vatican City State under Pope John Paul II and Pope Benedict XVI. "We mourn the loss of a dedicated shepherd," said current Detroit Archbishop Allen H. Vigneron, who had served as a priest under Cardinal Szoka in the 1980s. "For sixty years Cardinal Szoka gave himself totally to his priestly service of Christ and his Church. He has gone home to the Heavenly Father with our prayers. May the Lord give him the reward of his labors." 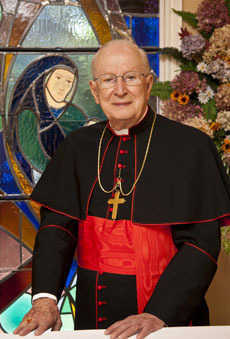 Following his retirement from active ministry in 2006, Cardinal Szoka had been living in Northville. He died last night, August 20, of natural causes at Providence Park Hospital in Novi. A day after his 79th birthday in 2006, Pope Benedict XVI accepted Cardinal Szoka's resignation. There will be a Rite of Reception of the Body at the Cathedral of the Most Blessed Sacrament, 9844 Woodward. on Sunday at 2:00 PM. Cardinal Szoka will lie in state at the Cathedral on Sunday and Monday from 2:00PM until 9:00PM and on Tuesday from 9:00AM until the Funeral Mass at 11:00AM with Archbishop Allen H. Vigneron presiding. There will be several prayer services as well: The Office of the Dead on Sunday at 7:00PM, a Rosary on Monday at 3:00PM and a Vigil Service on Monday at 7:00PM. The burial will be at Holy Sepulchre Cemetery in Southfield following a funeral procession from the Cathedral on Tuesday.